DARIEN, IL – March 14, 2018 – A new study shows that a high percentage of military personnel with sleep disturbances met criteria for nightmare disorder, but few of them reported nightmares as a reason for sleep evaluation. Those with nightmare disorder had an increased risk of other sleep and mental health disorders. Results show that 31 percent of military participants had clinically significant nightmares, and trauma-related nightmares occurred in 60 percent of them. Participants who met criteria for nightmare disorder were five times more likely to have post-traumatic stress disorder (PTSD), four times more likely to have depression, three times more likely to have anxiety, and two times more likely to have insomnia. Despite their common presence, nightmares were reported as a sleep-related concern by only 3.9 percent of military personnel. "This research provides a basis for furthering the study and knowledge of nightmares in survivors of traumatic experiences," said principal investigator Dr. Jennifer Creamer, medical director of the Sleep Medicine Center at Martin Army Medical Center in Fort Benning, Georgia. "Treatment of nightmares can lead to improvement in sleep, quality of life, and other disorders such as suicidality." The study results are published in the March 15 issue of the Journal of Clinical Sleep Medicine. Nightmares are vivid, realistic and disturbing dreams typically involving threats to survival or security, which often evoke emotions of anxiety, fear or terror. A nightmare disorder may occur when repeated nightmares cause distress or impairment in social or occupational functioning. According to the authors, this was the largest study to assess clinically significant nightmares in an active duty population referred for the evaluation of sleep disorders. The study involved 493 active duty U.S. military personnel. Participants had a mean age of 38 years, and 78.5 percent were men. Participants predominantly served in the Army (45.6 percent) and Air Force (45.2 percent); 9.2 percent served in the Navy/Marines. Approximately 74 percent of them had been deployed. Those with trauma-related nightmares were more likely to have traumatic brain injury, PTSD, anxiety and depression. Nightmares beginning within three months of a trauma are present in up to 80 percent of patients with PTSD, and these post-traumatic nightmares may persist throughout life. Post-traumatic nightmares may take the form of a realistic reliving of a traumatic event or may depict only some of its elements or emotional content. 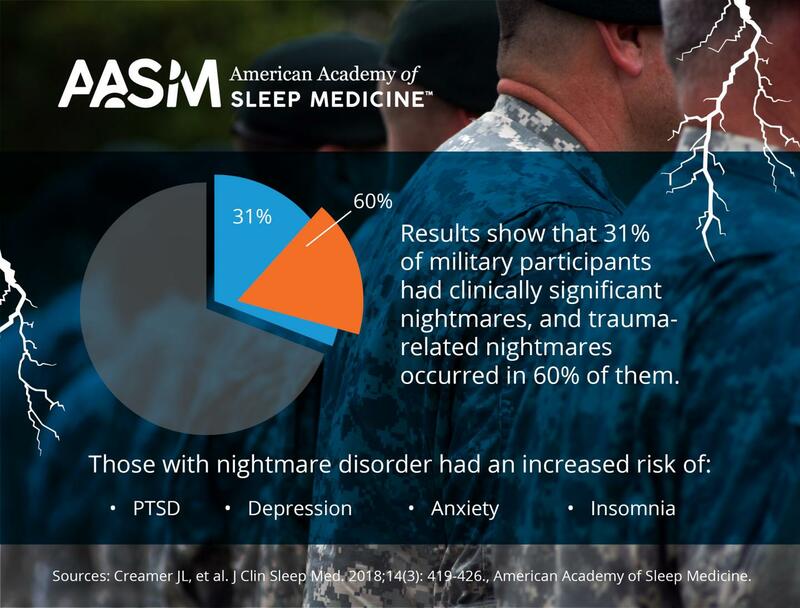 "Nightmare disorder is highly prevalent but under-recognized in military personnel with sleep disturbances," said Creamer. A best practice guide from the American Academy of Sleep Medicine indicates that treatment options for nightmare disorder include medications, most prominently prazosin. Several behavioral therapies also can be effective, such as image rehearsal therapy and other nightmare-focused cognitive behavioral therapy variants. "Military personnel and health care providers require education that nightmares are not normal and there are treatments available," added Creamer. The monthly, peer-reviewed Journal of Clinical Sleep Medicine is the official publication of the American Academy of Sleep Medicine, a professional membership society that improves sleep health and promotes high quality, patient-centered care through advocacy, education, strategic research, and practice standards (https://aasm.org). The AASM encourages patients to talk to their doctor about sleep problems and visit http://sleepeducation.org/ for more information about sleep, including a searchable directory of AASM-accredited sleep centers.